Cough & Cold season hit here in full force last week. Family and friends are sneezing, coughing, and suffering with sore throats and such. I'm brewing many cups of green tea laden with honey, ginger, and lemon; and making soothing infusions of marshmallow root, slippery elm bark, linden, and oat straw for the cold suffers in my household. 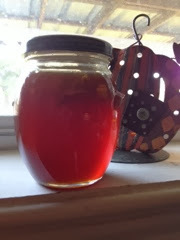 I made my first batch of Elderberry Honey of the season yesterday and I am taking that along with Echinacea tincture to keep my own immune system strong and hopefully avoid becoming ill myself. On the windowsill I have a small jar of ginger infused honey that will be ready soon for soothing sore throats and flavoring herb teas. Meanwhile, the soup pot simmers with nourishing vegetable barley stew, heavily spiced with onions, garlic, and ginger; and the humidifier freshens the air with steam infused with eucalyptus, rosemary, and peppermint essential oils. 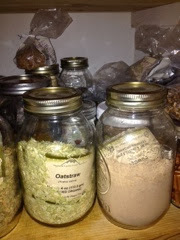 What's brewing in your home this season? I just love fresh ginger tea. 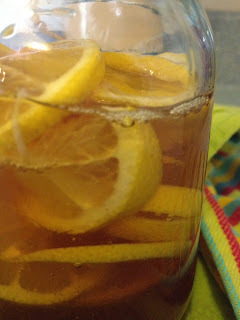 Homemade ginger ale is great, too. Thanks for the link for ginger honey. I think I'll try that next. Sounds nummy. I love ginger tea, ginger cookies, gingerbread, ginger everything! I've yet to make ginger ale, but it would be fun to try. Do you have a favorite recipe? Thank you for sharing your recipes. I had been looking online forever (well, it seemed like it) for a recipe for Elderberry Syrup using dried elderberries (what I had on hand from Mountain Rose). The recipe was easy to follow and simple to make. I now have some in our fridge and hopefully it will keep us healthier this winter.